Since its founding in 1892, Connie Maxwell Children’s Home has positively impacted the lives of over 17,000 individuals. Today, its five campuses provide shelter, nourishment, counseling services, recreational activities, and spiritual guidance to school-aged boys and girls in the South Carolina cities of Greenwood, Florence, Mauldin, Chesterfield, and Orangeburg. Connie Maxwell also offers services to families, such as life skills training, parenting classes, financial education, foster parent support, and help with transitioning to independent living. For Connie Maxwell Children’s Home to change lives for the better, people have to know about the organization and what it does. We set out to explain the comfort and security Connie Maxwell offers to children in need, sharing vital facts like services and locations in a friendly, accessible manner. 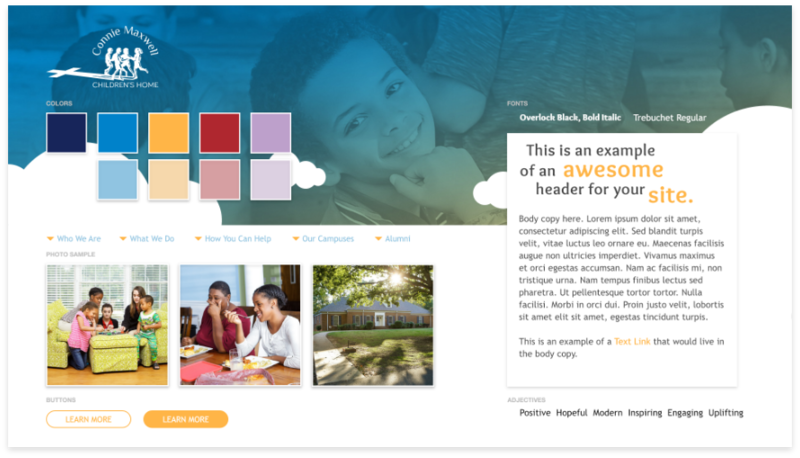 The artistic direction for this website was inspired by the feelings of hope that Connie Maxwell fosters in its patrons and the community at large. The bright color palette, gradient overlays, and smiling faces give it a welcoming, upbeat tone. 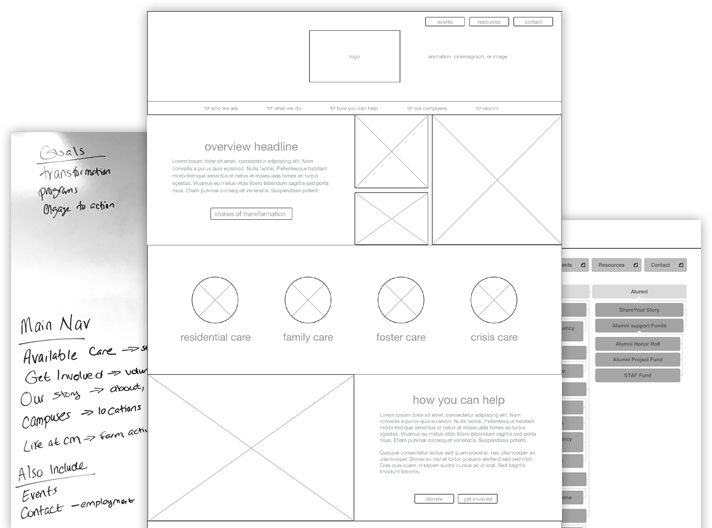 The structure of the website is designed to highlight all of Connie Maxwell’s campuses and convey the sense of community fostered in each one. 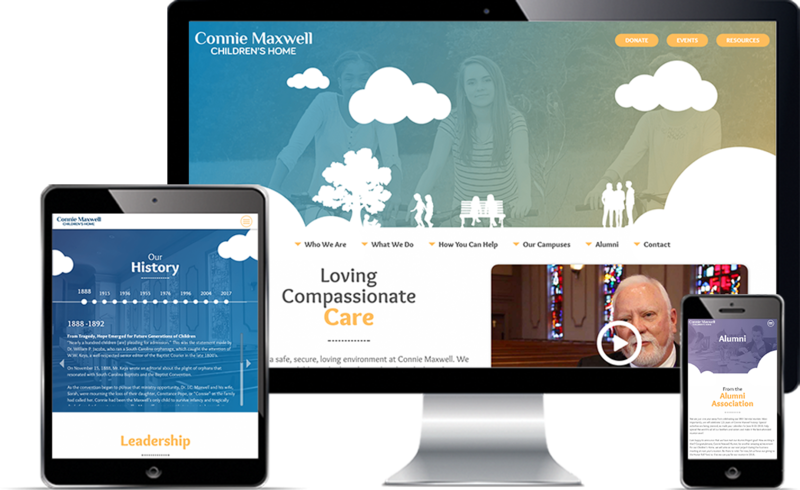 We developed a completely new brand for Connie Maxwell, with images, colors, and graphics conveying the hopeful, inspiring message that the organization shares with its clients—and the world. 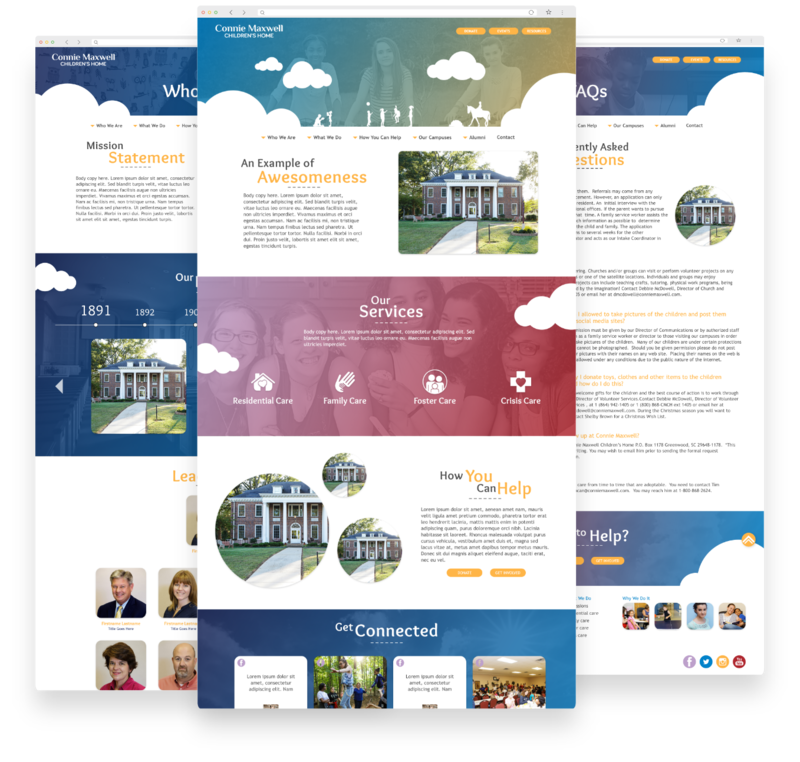 The completed website fulfills several important needs: illustrating what Connie Maxwell does in the community and who it serves, sharing messages of hope with families in times of struggle, and fostering lasting relationships with alumni and members of the community. We’re proud that our work is able to help Connie Maxwell support and comfort children throughout South Carolina!